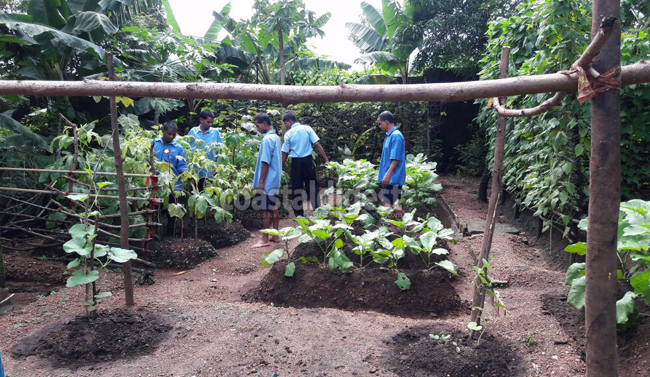 A host of home-grown vegetables welcome the visitors at Beggars’ Rehabilitation Centre (BRC) at Pachanady in Vamanjoor on the outskirts of the coastal city of Mangaluru. Once barren land with laterite rocks, today the 2-acre land boasts of its lush-green vegetation across its one-acre landscape. Brinjal, Coriander, Drumstick, Green chilli, Pumpkin, Spinach, Mint leaves, Jackfruit, Mango; are among the several vegetables that the inmates have raised with their labour. "Although, it was initially a challenge to motivate them, now most of them, either through self motivation or inspired by others have taken to cultivation on their own. They tend to the crops as their own and use it for self-consumption," Ashok, in-charge of BRC said. Besides vegetation, the Centre ensures that inmates do not spend their time idling. Beyond the normal rest or sleeping hours, the inmates are involved in pre-seeding work, tilling the soil, watering the soil beds, preparing organic manure, timely harvesting and gardening. While some of the woman inmates engage in agriculture, they also involve in envelope making, crafts, early morning walks, exercise or at least their routine chores such as washing their own clothes. Well educated, hailing from an affluent family, with two brothers employed in reputed banks, Anupama* (28) had everything she had asked for. But in an unfortunate turn of events, the sudden demise of her parents few years ago, Anupama found herself roaming around the streets of Pandeshwar in Mangaluru. Beyond recognition, begging for food with pedestrians, she would sleep on the streets and roam about aimlessly. Reported by the local residents in 2014, Anupama’s plight caught attention of the jurisdictional Pandeshwar police, who shifted her to BRC. In a span of one year, Anupama, who formerly found solace in anonymity and in begging alms, today has become a tailor. She came out of the BRC and eked out her living through tailoring. Anupama also slapped legal cases against her brothers who had allegedly cheated her of property. “She currently owns a property in Karkala, with bank deposits bequeathed in her name by her mother,” her case officer adds. Another, Ramesh*, an electronics and electrical engineer from Chennai addicted to drinking and drug abuse had abandoned his family. He was brought to BRC that kicked-out his alcohol habit. Now working in an MNC, Ramesh is back on top of his game and works for a multinational company in Chennai. BRC that began in 1991 under Karnataka Social Welfare Department today has grown to be one of the most trusted of the 14 Centre’s in the state. Upon the identification of an individual as a destitute or a beggar, Mangaluru City Commissioner (MCC), Taluk court, Chief Executive Officer (CEO) of Taluk Panchayat, District level officer(s), and jurisdictional Police Sub-Inspector are empowered to detain and surrender destitute/beggars at the Centre. In-charge of BRC, Ashok says that the Centre’s team and staff guard travel around their respective districts and identify the beggars and bring them to the court within 24 hours. As per the current provisions, they can house a beggar for one-year. During which, through a series of vocational and counseling sessions, it can encourage a destitute to quit begging and live independently. “Once the Centre is reassured of their skills, the Centre informs their family members and requests to take them back. In the absence of the family, the member is referred to a government aided Centre.” Ashok said. Over the year, BRC has aggregated destitute from different parts of the country in its Mangaluru Centre. "Since, Mangalore Central Railway Station is the last station in the region, majority of them de-board the train here and venture into the city. Most of our inmates are from Karnataka, Tamil Nadu, Kerala and Andhra Pradesh," a BRC official says. A team of psychiatrists, doctors, skin specialists, who visit once in 15-days, have the mandate to ensure that the inmates are hale and healthy. Over the years, for about 137 destitute in Dakshina Kannada, BRC has become a haven for transformation; Owing to alcohol, substance abuse, financial stress and family issues, these inmates who had once resorted to begging today claim of confidence to thrive with their abilities.